Nik Nowak is a Berlin-based artist and musician. In his artistic works, which manifest themselves in various media, he often deals with the effect of sound. He is particularly interested in the ambivalent role of sound systems as cultural catalysts on the one hand and as acoustic weapons on the other. Nowak has become known for works and sound objects such as the mobile booster, tanks and the echo drones. 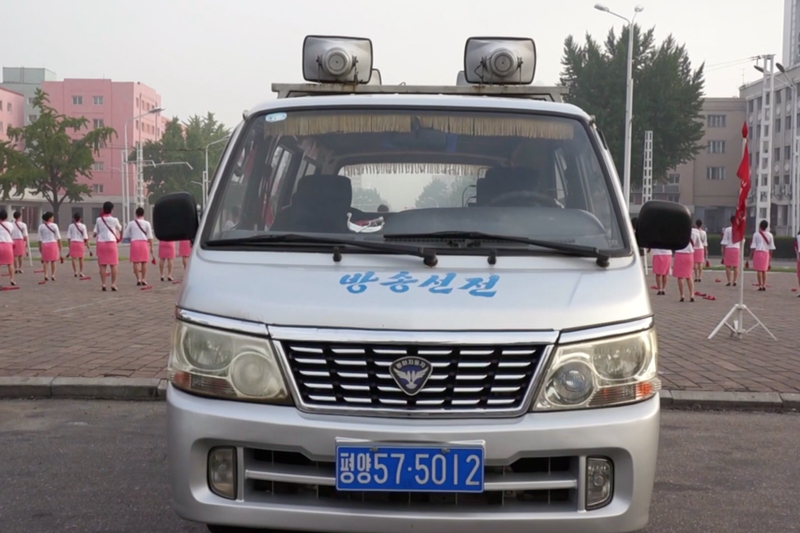 In August 2017, Nik Nowak traveled to North Korea as part of a group of artists. In a time of geopolitical tension and the verbal showdown between Donald Trump and Kim Jong-Un, the DMZAcademy had organised an exchange with artists from the University of Pyongyang to realise various art projects and workshops. Nowak planned to play an identical note on the sound systems facing each other on the border between North and South Korea – but phase-distorted, so that the sound waves would cancel each other out therefore creating an active silence: »Symphony of Silence«. Due to objections of North Korean authorities against the title of the work, but especially against the use of military equipment, and propaganda loudspeakers the project could not be realised. Nik Nowak will present two video pieces that emerged from this project. »Notes Towards A Symphony of Silence« is his cinematic sketchbook; »No Silence for the Great Leader« documents his observations in the isolated country of North Korea: his guided-semi-touristic / semi-professional view of Pyongyang – stagings of everyday life, how the planned artistic exchange was turned into a showing-off of North Korean greatness, and finally, how Nik Nowak was granted in a compensatory gesture the realisation of an alternative project.